My mom originally planned to come visit me in Europe while I was studying abroad. One of the countries she most wanted to visit was Germany, since much of our ancestry is German and because she is very interested in Germany’s history. Unfortunately she was unable to visit me because of work, but she told me one thing I needed to do: visit a concentration camp. When I did my first big tour of Europe, I was planning on going to Poland to visit Auschwitz, the most notorious of the concentration camps. I ended up not getting to Poland because it was not included on my Eurail pass, so instead I was going to go to Dachau, which is located close to Munich, Germany. Again, that didn’t happen. Fortunately I was able to stay an extra month in Europe, so I planned a separate trip just to Poland. My second day in Poland, I woke up at the crack of dawn, bought a roll from a street vendor, and walked to the bus station. I then took a mini-bus (literally, it was mini-bus… much like the ones in the US except with an aisle and a few more seats) an hour and a half away to the town of Oświęcim, where Auschwitz concentration camp is located. First, a few things. 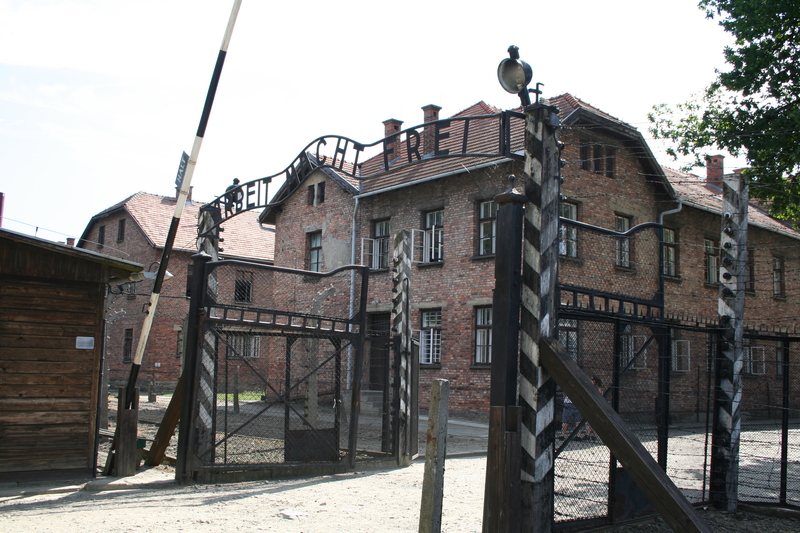 Auschwitz is the German name for “Oświęcim,” and Auschwitz concentration camp is not just one camp. It is an entire network of camps, and was the largest of the Nazi concentration camps. I visited two camps within the Auschwitz network, Auschwitz I and Auschwitz II-Birkenau. There are a few different types of Nazi concentration camps, the two most well-known being labor camps and extermination camps. The important difference between these two is that the primary function of extermination camps was the murder of large amounts of people. Usually in these camps, prisoners were killed almost immediately after arrival. Labor camps were designed to put prisoners to work under harsh conditions, but they were not set up solely to kill people. Some camps were combinations of the different types of concentration camps. 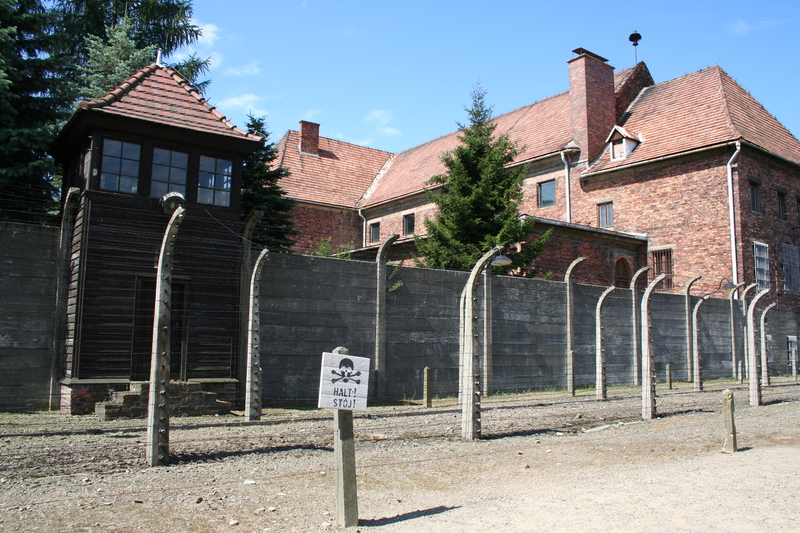 Auschwitz is considered by many people to be an extermination camp, but part of the camp was used as a labor camp, so it is not solely an extermination camp. This will be discussed in more detail later, but it is important to keep in mind. The mini-bus dropped me off right in front of Auschwitz I, and I was a little… well, confused. It was nothing like I had expected. I had expected a more rural setting for a concentration camp. I thought it would be situated in the fields or in the forests, but instead it was located right in the middle of the town. I could see stores within distance of Auschwitz I, just down the road, and it was surrounded on four sides by roads. I didn’t like it. To me it felt less horrific, more integrated into the town. Also, it was a bit creepy. I mean, can you imagine driving down the road through town and seeing a concentration camp right there? Yeah, weird. I was now within the concentration camp. Auschwitz I is a pretty small and compact camp, which was built in 1941. All around me were brick buildings (called “blocks”), connected by a wide dirt/rock path, with a few patches of grass outside the fronts of the buildings. Remember how I said that the Auschwitz network is a combined extermination-labor camp? Auschwitz I was mainly used as a labor camp. When prisoners were shipped to Auschwitz, they arrived by train at Auschwitz II-Birkenau. Those deemed fit to work either stayed at Auschwitz II-Birkenau, or were forced to walk the approximately 1.5 miles to Auschwitz I. Some people died from exhaustion on the walk to Auschwitz I following the arduous train ride. Even though Auschwitz I was used mainly as a labor camp, it had a high rate of death because of the difficult work and poor living conditions prisoners experienced there. Within some of the blocks at Auschwitz I are exhibitions, so I went through those. The beginning blocks deal a bit with the history of the Holocaust and the concentration camps. In one of the blocks was a room filled with hundreds of empty cans of Zyklon B, which was the poison used in the gas chambers. Near this was a huge model of one of the gas chambers. As you continue through the blocks, it becomes more personal. When Auschwitz I was first established, prisoners were photographed upon entering the camp. These pictures line the hallways of some of the blocks, complete with the name of the person photographed and their fate. In one of the blocks, the rooms were filled with the personal possessions of those murdered. There was a room filled with suitcases, one with glasses, one with cookware… it went on and on. These rooms have a strong emotional impact because it gives you a visual sense of how many people were killed during this horrible time. I did fine with these rooms until I reached the room filled with prostheses. At that point I was like okay, that’s enough, time to get outside. One of the most well-known rooms in the exhibition is the room with the women’s hair. Before women entered the gas chambers, their hair was shaved off. The Nazis planned to use this human hair for producing textiles. After the war, all this human hair was found–1650 kg of it. It’s not something that I can describe and make the same impact on you as just seeing it. It’s one of those things you have to see to believe. It was disturbing, though, and it really makes you think about the number of people who died during the Holocaust. Another block in Auschwitz I shows the living conditions of the prisoners throughout the history of Auschwitz I. When the camp was first established, prisoners slept on straw. Later pallets were brought in, and eventually bunk beds were built. This block also showed what the washrooms looked like, and how the rooms for supervisors looked. Eventually I came to Block 11, which was known as the “death block.” In between Blocks 10 and 11 is a courtyard, and it was here that prisoners were shot. Holding cells for prisoners were located in the basement of Block 11. There were a few different kinds of holding cells. Some cells were “starvation cells,” where prisoners were given neither food nor water until they died. The “dark cells” had limited air flow, so prisoners kept in these cells would suffocate as they used up all the air in the cell. Finally there were the standing cells. Four prisoners would be crammed into one standing cell (and believe me, these cells are tiny) so that they had no room to sit or lie down. The prisoners kept in these cells were forced to work all day long and then were put into these cells at night, most times for twelve or more nights. Many prisoners kept in the standing cells died from exhaustion. The Nazis also tested the use of Zyklon B as a gassing agent in the basement of Block 11. Blocks 19-21 and 28 were used as an infirmary for sick prisoners. However, many of those who went to the infirmary died, as medication and treatment facilities were in short supplies. In addition, after 1941 the SS doctors carried out selections among sick prisoners, and many of those sick were used in medical experiments. One part of the exhibition showed pictures of prisoners used in medical experiments after they were liberated from Auschwitz. Even after months of treatment, these people were still unnaturally thin and sick. 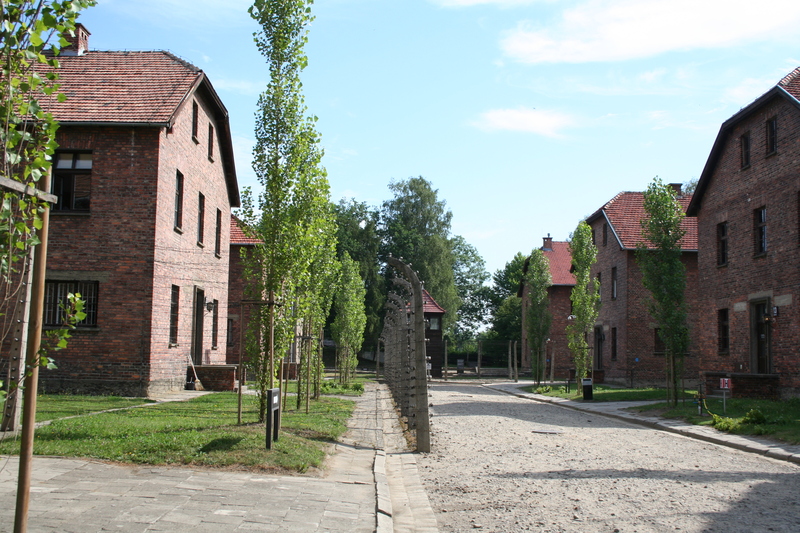 Some of the blocks in Auschwitz I chronicle the history and treatment of specific groups of people–for example Dutch Jews, Polish Jews, Sinti, Roma, etc. I did not go through all of these exhibitions because there were so many of them, but I did walk through the exhibition about Polish Jews. It was just ridiculous. Hitler invaded Poland because he wanted to make room for the Germans to expand east. Also, he hated Polish Jews with a passion and wanted to rid the world of every last Pole. It’s for this reason that about half of the six million Jews killed in the Holocaust were Polish, and why most of the extermination camps were set up in Poland. It was atrocious. After going through these exhibitions, I came to the gas chamber and crematorium. Again, because Auschwitz I was not primarily used as an extermination camp, there was only gas chamber. People were gassed in the gas chamber here starting in 1941, but as Auschwitz II-Birkenau was built with expanded gas chamber facilities, gassings were gradually stopped at Auschwitz I. The space was converted for storage, but after the war, the museum partially reconstructed the gas chamber and crematorium. 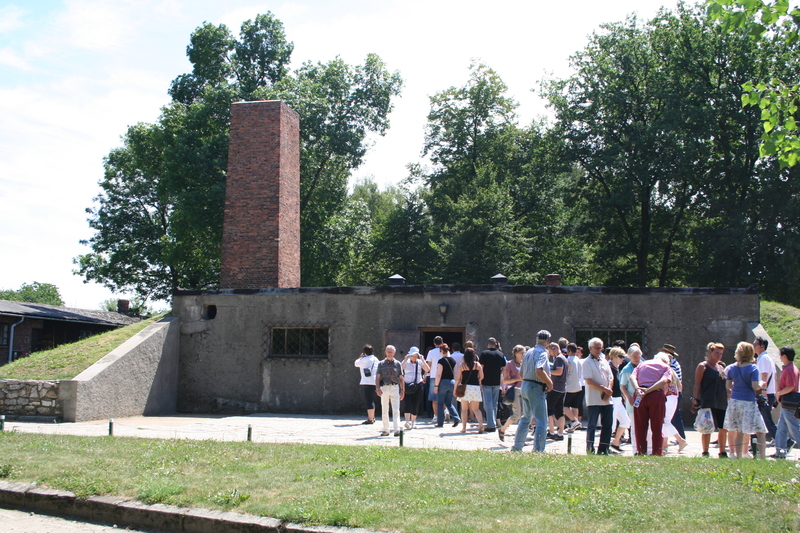 It was chilling to walk into the gas chamber and realize that people were murdered in that very space. By this time I had reached the end of the camp, and it was past noon. I ate lunch at the canteen connected to the museum (by the way, when they say ‘mushroom pizza’ in Poland, they don’t mean a pizza with mushrooms on top. They mean dough with a layer of mushrooms covered with cheese) as I reflected on the experience. Again, Auschwitz I was not quite what I expected because of its more urban setting. The exhibition was very powerful for making you connect to the people who were murdered in the Holocaust. It didn’t make me sad in the way I expected, though. For most people, going to Auschwitz doesn’t invoke tears. It makes you sad, but it’s not the kind of sad that makes you cry. It’s the kind of sad that makes you feel crappy inside, like you’re depressed and have nothing to feel happy about. It’s the kind of sad that weighs you down and follows you all day, as if you were being followed by a rain cloud. Unbelievable that humans can preform such atrocities on other humans. I guess that’s pretty much the history of the earth…. Unsettling… I could see how visiting that place could leave a dark cloud with you forthe day. Good story.and account of your tour. Thanks for the comment, Hutch! It was definitely an unsettling experience.